Parimarjan Negi is a former child prodigy who is the second-youngest player of all time to obtain the Grandmaster title. He was Asian Champion in 2012, and is a key member of the Indian national team which won bronze medals at the Tromso Olympiad in 2014. It's so good! It shows everything that you need to produce world-class preparation." “I know Parimarjan well enough to know what he is capable of when it comes to chess analysis. He was foolish enough to be totally honest in his book, not hiding anything from the readers, and now a bunch of new creative ideas in 1.e4 is out there in the open. The day after the book was on sale I won a nice game at the Olympiad with White against a French Defence in a topical variation, following one of his recommendations. No, it was not a coincidence! And yes, I am a quick reader." "I’m a hard man to please, and no more so than when it comes to chess books. I expect honesty, I expect diligence, I expect innovation, and, perhaps most difficult of all, I expect my short attention span to be entertained at all times. It’s a tough sell, I grant you. But every now and then, every once-in-a-FIDE-cycle, a book comes along that seriously impresses me. And recently, I received another of these rare, pleasant shocks. 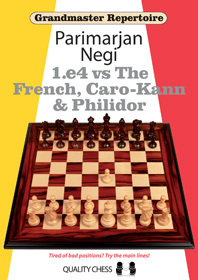 Indian GM Parimarjan Negi’s first book of his 1.e4 repertoire series is a real stand-out, an excellent piece of chess authorship. And it even kept me engaged! The analysis in this book is ahead of its time in terms of theoretical relevance, and I dare say will prove to be the benchmark for 1.e4 theory for several years to come." "Many authors add in explanations these days, but Negi goes further. It's pleasant to see so much informative text in a book which is supposed to be pushing at the boundaries of theory. It's all there: the background, the relevance in practice, the logic, the threats and all the strategy, all flowing in a style that is a pleasure to read and gives the impression that it's been well thought through." "Quality Chess has produced many fine opening books, but [this] might arguably be the best one so far. Negi doesn't just regurgitate current theory. There are many interesting novelties and lots of original analysis in this volume... What makes this book special is Negi's communication with the reader. He carefully explains why he chooses one line over another and what led him to do so." "The Indian GM Parimarjan Negi may be little known in this country, but as a result of this book, that is likely to change abruptly! For me this book is a highlight from Quality Chess. Super analyses and great comments makes the book more than satisfactory." "Summing up, I think readers will be very impressed by the quality of the analysis, but none of it can be learned quickly. This is a book for hard working chess players who already play at a high level, typical of the standard we have come to expect from Quality Chess's Grandmaster Repertoire series." "Another hit from the Grandmaster Repertoire series. If you want a reference book, you need look no further."